Northern Perth Basin on trend from the analogue producing, Gingin/Red Gully gas and condensate field. 120 square kilometres* *Area to be excised from a larger exploration licence, just focussed on the Walyering Gas Field. **Assumes option exercised to earn the interest by funding a 3D seismic survey in 2018, covering the Walyering Gas Field. 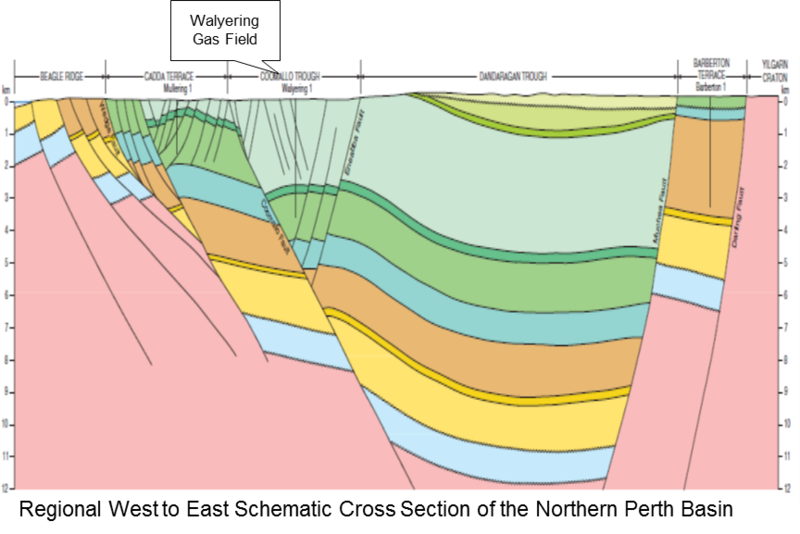 The Walyering Gas Field was discovered in 1971 and a small compartment briefly put on production, producing about 0.25 Bcf gas. It is still crossed by the Parmelia gas trunk line that has available capacity. 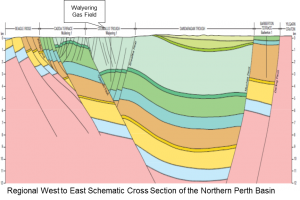 The field is located in a large, faulted anticline on the west side of the Dandaragan Trough which hosts the source kitchens for most of the gas discovered in the Basin. A thick interbedded fluvio-deltaic sandstone reservoir system is present with top and lateral seals mostly provided by intra-formational shales and siltstones. 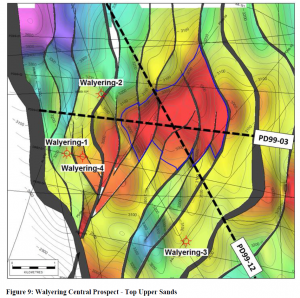 The target reservoirs are relatively deep, between 3,000m and 4,000m but when drilled correctly have been shown to have good natural flow potential. The Upper Cattamarra Coal Measures sand reservoir in Walyering-1 flowed naturally to surface at up to 13.5 MMcfd. 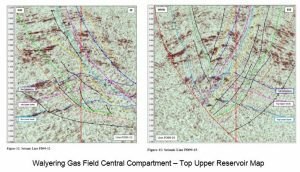 The reservoirs and trapping mechanism are very similar to that in the producing Gingin – Red Gully gas fields on geological trend some 80 km to the south. 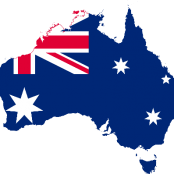 Pancontinental acquired Bombora Natural Energy Pty Ltd in July 2017, expanding the Company’s portfolio to add in a range of relatively low risk, onshore gas projects. This included the right to farmin for a 70% operated interest into an area within EP-447 in the Perth Basin, covering the Walyering Gas Field. 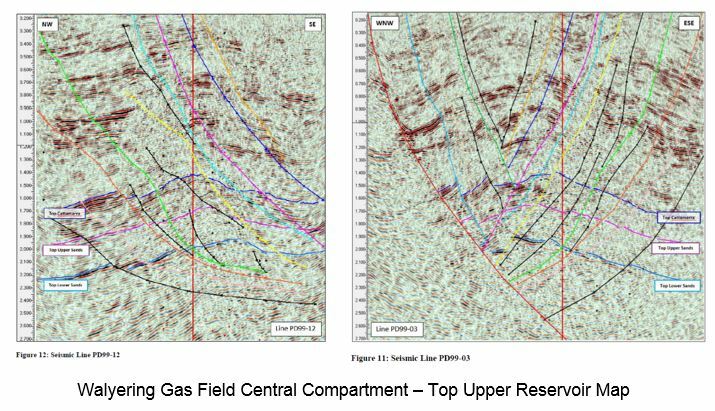 Pancontinental’s technical interpretation is that the central and highest elevation part of the Walyering Gas Field has yet to be drilled. The Company has an option to carry out a 3D seismic survey to better define the structure and the largest compartment for future appraisal drilling. The Company is processing an application to conduct a 90km² 3D seismic survey. This is a challenging process requiring environmental, heritage (Aboriginal Native Title) and land holder approvals before the regulatory authority can issue a permit. Subscribe to our Investor Alerts to receive announcement and other notifications.